Soccer in America took a big step to foster youth development with Major League Soccer and USL Pro announcing a partnership while Orlando City became Sporting Kansas City's USL affiliate. "We are fortunate Orlando City has agreed to partner with us in this new, groundbreaking opportunity. They are a class club and this will be a great partnership for both organizations," Sporting Kansas City Manager Peter Vermes said. "It will provide beneficial opportunities for our players to develop within a competitive environment for a tremendous organization and fanbase. Together, our shared vision for this affiliation made it easy for us to enter into the opportunity." meanwhile in other parts of Major League Soccer, D.C. United affiliated with USL Pro side Richmond Kickers, New England paired up with Rochester and Philadelphia with Harrisburg. 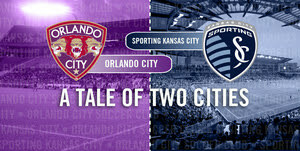 Orlando City, who is about to enter the the 2013 USL Pro season, could use this boost with Sporting Kansas City while maintaining its close relationship with Barclays Premier League side Stoke City, who sit 10th in Premier League table. Mike Gramajo is a writer for Orlandocitysoccer.com. Opinions expressed are his and his only and do not come he contents of this page have not been reviewed or endorsed by the Orlando City SC. All opinions expressed by Mike Gramajo are solely his own and do not reflect the opinions of Orlando City SC.